Frank Shock, the son and a partner in the grocery business, was born February 2, 1904, in Clay City, and like his father, with the exception of about three years when he had employment with the American Steel Foundry in East St. Louis, has continuously lived in Clay City. 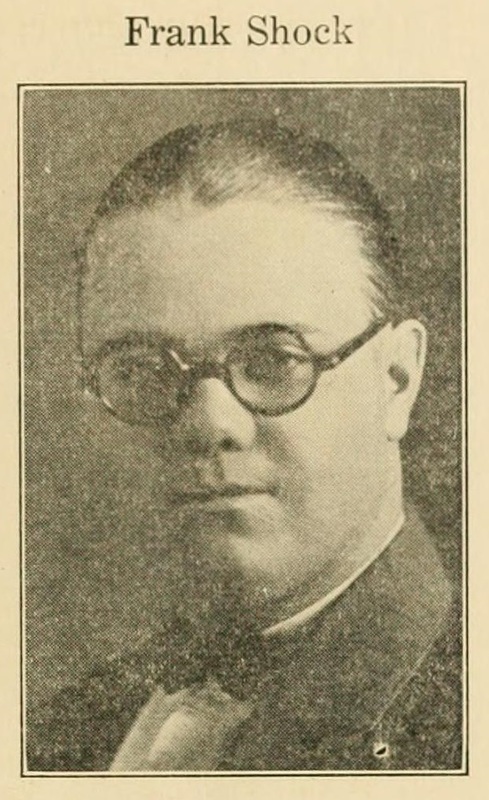 He went to St. Louis directly after finishing school and almost immediately after his return home entered the grocery business with his father in February, 1926. For the benefit of anyone who might be interested in knowing, we might state here that Frank isn't married, except to his place of business, and not quite so in that case because Frank enjoys base ball and is frequently called upon by some neighboring town ball clubs to help them win a game and he is able to put up his part of a good game, too. Both he and his father are members of the Clay City Booster Club and are boosters for their home town.